Salina area state representatives were back in town Saturday to provide an update on the 2018 Legislative Session. A gathering of about 30 people jotted down questions for State Senator Randall Hardy and State Representatives, Steven Johnson and Diana Dierks to respond to during the 90-minute meeting. Represent J.R. Claeys was unable to attend. Topics ranged from concerns about medical coverage and Medicaid expansion in Kansas, school funding and school safety, and gun issues. 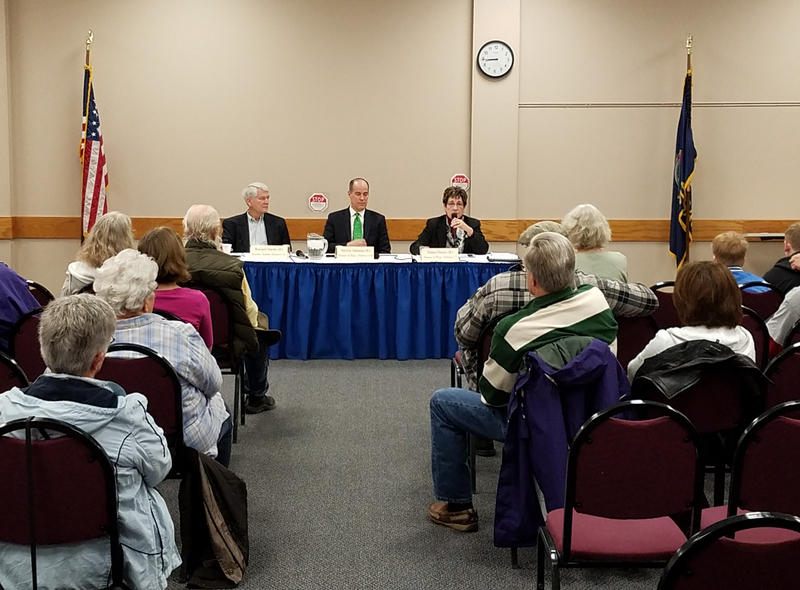 Senator Hardy said gun ownership restrictions are needed for domestic violence offenders, and more consistent registration requirements are needed. He said that legislation has passed in the senate dealing with the domestic violence issue, and dealing with reciprocal concealed carry agreements between neighboring sates. Representative Johnson said that he believes handguns and rifles should have similar requirements for ownership. Much of the conversation centered on education issues, and a much anticipated 164 page study that was released on Friday afternoon to help provide an independent measuring stick to what the Kansas Supreme Court calls inadequate funding. Representative Dierks said that she has already found some errors in the $230,000 study. Lawmakers have been tasked with writing a new school funding law before July 2018. The consensus was that probably between $450 million and a billion more dollars will be needed for education. As far as school safety issues were concerned, Johnson said at the state level they can provide support, but local control is really what is most important. He said that unfortunately, budget cuts have had an impact on school safety. Dierks said that bullying issues are a factor as well. She is passionate about new anti-bullying legislation, and programs currently being discussed. Only 1 person opposed to Medicaid expansion in Kansas. Only 1 person favored no increase in education funding. The majority favored increasing education funding by a minimum of $650 million. Legislators will be back in Salina for their third update on April 21st at the Chamber. The event was moderated by Joyce Volk.